As the 2018-2019 high school basketball season heats up, there is a notable Jackson County Connection with the Canal Winchester High School boys’ basketball team. For the geographically unfamiliar, Canal Winchester is a rapidly growing small city which straddles Franklin and Fairfield counties southeast of Columbus. The basketball Indians of Canal Winchester are earning big-time recognition in Central Ohio with a perfect 12-0 record through last weekend’s games even though they play in the tough Ohio Capital Conference. 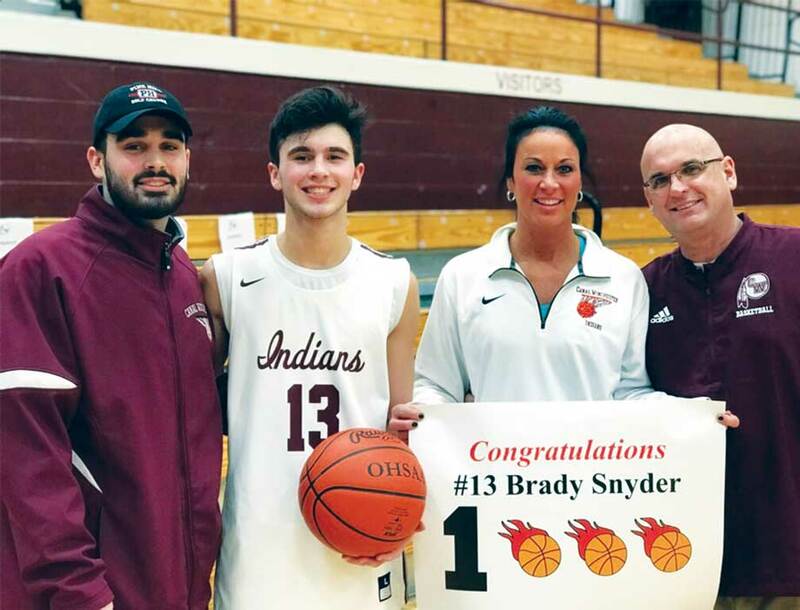 Head Coach Lyndell Snyder is in his fifth season and his son, 6-1 senior point guard Brady Snyder, is the team’s leading scorer and one of the top players in Central Ohio. The local connection is that Lyndell’s wife and Brady’s mother, is Kellina Cooper-Snyder, who is the daughter of Jackson area residents Bill and Lela Cooper. Kellina graduated from Jackson High School (JHS) in 1991 and was an outstanding student-athlete in her own right, starring in volleyball, basketball, track and cheerleading. She and her older sister, Billina, made for a dynamic duo on very successful Ironlady volleyball and basketball teams of that period. The girls’ older brother, Butch, was an excellent football player. One of the Indians’ closest calls came very recently against the Chillicothe Cavaliers, but Brady hit a buzzer-beating three-pointer to provide Canal with the 70-67 victory. Brady, who had 28 points in that climatic contest, has drawn interest from such colleges as Capital, Marietta and Ohio Christian University. Just last Friday, the Indians defeated perennial state power Newark, then followed that up Saturday with a 101-54 win over Worthington Kilbourne in a game in which Brady compiled the coveted “triple double” with 15 points, 12 rebounds and 10 assists. Meanwhile, back in Jackson County, Billina’s sons, Cooper and Caden, are both starters for the Jackson Ironmen, who are off to an outstanding 10-3 start to the season. Cooper is the team’s leading scorer and rebounder and Caden is considered the team’s defensive specialist. Cooper, a four-year starter, has a good chance to reach the 1,000-career-points plateau. Cousin Brady eclipsed the 1,000-points barrier earlier this year and his older brother, Brendan, just missed the milestone with 940 career points. The Snyder boys came by their basketball talents naturally. Not only was Kellina an accomplished athlete, but their father, Lyndell, was All-Ohio in both football and basketball at Canal Winchester and scored 1,036 points as a high school hoopster. He went on to play collegiately for four years at the University of Rio Grande where he met Kellina who played three years on the Redwomen volleyball team as well as one year on the track team. In addition to taking an obvious interest in Canal’s boys’ basketball team, Kellina is also the head varsity volleyball coach at Canal Winchester. Billina used her great athletic success at JHS as a springboard to a truly great collegiate career at Rio Grande in volleyball where she was later selected as an All-American while achieving multiple NAIA/NCAA records. Her achievements landed her a place in the Rio Grande Athletic Hall of Fame. After coaching volleyball on the high school level, including a stint at JHS, she returned to Rio Grande where she has been the head volleyball coach for the past 11 years. Another Jackson Connection: Billina’s daughter, Kinnison, is a starter for the Redwomen volleyball team along with her JHS teammate, Katie Hemsley, who is the daughter of Joe and Christie Hemsley. Both Kinnison and Katie were named as 2018 Daktronics-NAIA Scholar-Athletes for maintaining a grade-point average in the range of 3.5 to 4.0. Like Kellina, Billina met her future husband, Troy Donaldson, at Rio Grande where he was not only a star on the men’s basketball team, but also happened to be Lyndell’s teammate and roommate. All Troy did for the Redmen on his stellar career was score 1,960 points. Meanwhile, don’t forget yet another athletically gifted member of the Cooper family. Butch’s youngest child, Billy, who graduated from JHS in 2017, excelled in football, wrestling and baseball and is currently a catcher for the Mt. Vernon Nazarene University baseball team where he hit two home runs as a freshman. Meanwhile, Kellina’s Jackson County Connection remains strong, not only because of her family, but also through her founding and organizing of the annual COOPERSTRONG 5K Run and Walk, which is conducted each year in Jackson on the Saturday morning before Memorial Day. The event honors the memory of Kellina’s niece, the late Emileigh Jo Cooper, the outstanding Jackson High School student-athlete and Marshall University softball player, who tragically was killed at the age of 22 in a traffic crash in February 2016. She was the daughter of Butch and Jody Cooper and a sister to Sharissa and Billy. Prior to her death, Emileigh had been hired to serve as the head varsity softball coach at JHS and the proceeds from the COOPERSTRONG 5K Run and Walk have been used to support the JHS softball program and girls’ basketball program. The event has been spectacularly successful, raising a total of more than $34,000 in its brief three-year history, which is a testament to Kellina’s determination, the community’s love for Emileigh, and the standing of the Cooper family in the Jackson area. Kellina reports this year’s event will be held on Saturday, May 25 with pre-registration to kick off in February. Although she is making new and wonderful memories in Canal Winchester, the Jackson area and JHS will forever hold a special place in Kellina’s heart. For her, it’s not just about the strong family connection, or all the great experiences on and off the basketball/volleyball courts and inside the walls of the old Jackson Elementary School and the old JHS buildings. It’s more about the teachers, coaches, and other mentors who influenced her along the way and how they helped mold her with their words, actions and examples. She spoke very touchingly about the importance of her “roots” when she served as one of the speakers at the JHS Alumni Program in 2016. Specifically, she praised her elementary gym teacher Dan Morrow and former JHS teacher and head boys’ basketball coach Tony Bornhorst as being “great influences” in her life. She considers both Bornhorst and Morrow to be two of her most important role models. She recalls that Morrow seemed to see some athletic potential many years ago in a very young Kellina and he encouraged her to participate in organized recreation and athletics, which, of course she did. She remembers that he made the gym period fun and she looked forward to it each week. His influence cemented her interest in sports. Although Morrow left education and coaching at a young age to help lead his family business, Coll Auto Sales, he remains deeply connected to JHS athletics through his sports broadcasting and by being the father of current JHS boys’ basketball coach, Max Morrow. While Bornhorst did not coach girls’ sports, he was the head boys’ coach while Kellina was in high school. She says she learned a lot about coaching and motivation by watching his coaching style, how he handled his players, how he ran his program, and the manner in which he handled himself in general. Bornhorst was in Jackson for several years before moving up the coaching ladder to Dublin Coffman High School. He is now retired from teaching and coaching, but he and his wife, Dina, maintain many friendships in Jackson and remain friends with Kellina and the Cooper family. Canal Winchester may be Kellina’s new place of residence, but Jackson will always be home.